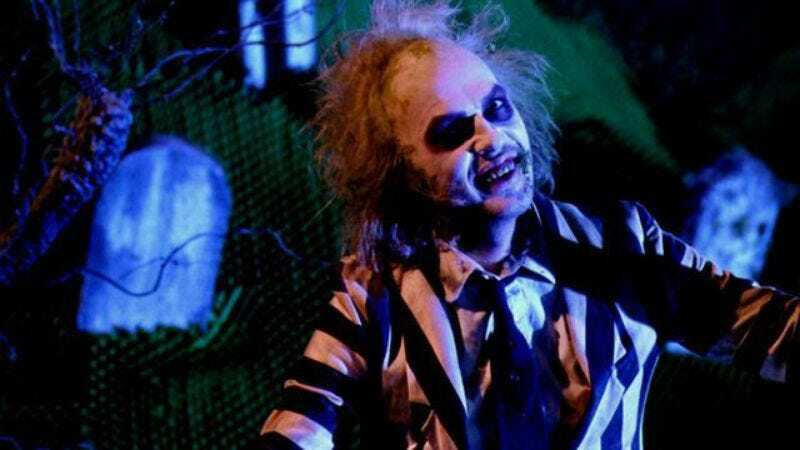 Following Tim Burton’s confirmation that, oh yeah, he would direct a second Beetlejuice starring Winona Ryder, screenwriter Seth Grahame-Smith has confirmed that the filmmakers definitely plan to bring back Michael Keaton as well. According to Grahame-Smith, the long-anticipated sequel will serve as a proper follow-up to the original story and won’t attempt to reboot the series with Melissa McCarthy or anything. For his part, Keaton is pretty excited to revisit the iconic role, according to his comments last night at the Golden Globes. He said he still feels connected to the character—which must be horrifying for his friends—and that his involvement is contingent only upon his and Burton’s availability. He also said, “I don’t know why we didn’t do another one two years later,” because Beetlejuice Goes Hawaiian was a good idea, damn it. Regarding the script for the new sequel, Grahame-Smith was tight-lipped about details, besides saying that it’s set in the present day. This suggests that Lydia may have a black-clad family of her own, and that Beetlejuice is probably still in that waiting room complaining about his shrunken head. Grahame-Smith also didn’t discuss the title of the sequel—though obviously, it should be Beetlejuice, Beetlejuice. That way if it becomes a trilogy, the last one can be called Beetlejuice, Beetlejuice, Beetlejuice, and Keaton himself can pop up in front of the movie screen at certain showings. Then he can hand people snakes and try to feel up their wives, tapping into that old Beetlejuice sweet spot somewhere between laughter and calling the police. Still, while both the screenwriter and Michael Keaton agree it’s not a Beetlejuice movie without the guy who played Beetlejuice, it’s possible we’ll see less of Keaton than we think: Grahame-Smith said he’s being careful not to overuse the character in the sequel, reminding fans that the Ghost with the Most doesn’t show up until the halfway point of the original film. But even limited Keaton is better than nothing, and the actor’s involvement surely would boost the film’s chances of being watchable.